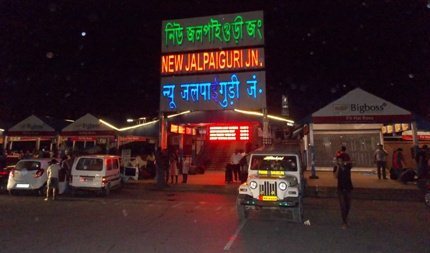 New Jalpaiguri or NJP is a major railway junction located about 88kms south of Darjeeling. Many long distance trains terminate or pass through this station. So if you are planning to visit Darjeeling by train, this is where you are likely to get off. However, the twin city known as Siliguri is only few kilometers away. There are some trains that pass through that station as well. Once in NJP, there are several options to get to Darjeeling including taxi, shared jeep, bus, Darjeeling Himalayan Railway operated Toy Train etc. The taxis take about 3.5 hours to reach Darjeeling. The buses are a bit slower. But the toy train which is hauled by diesel engine, takes over 7 hours and leaves at a fixed time in the morning. There are actually several roads to approach Darjeeling from New Jalpaiguri. Hill Cart Road is the main road and is generally maintained very well. This is a national highway (NH-55) and most commonly used by the local drivers. Road via Rohini is quite scenic and meets the National Highway at Kurseong. The road via Pankhabari is very narrow and winding but quite shorter compared to the others. One of the most scenic routes is the Route via Mirik with lovely views of tea gardens, but it's a longer route. Numerous stalls have come up just outside the NJP railway station. So if you plan to have your breakfast or lunch before heading for Darjeeling, there are ample options right here. Otherwise, you can take a rickshaw or a taxi to Siliguri town some 5-kms away, and ask the driver to take you to a proper restaurant. 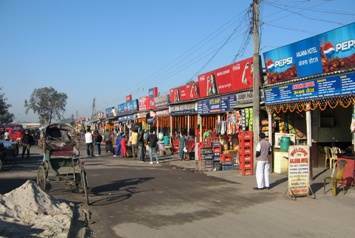 There are plenty of better and more hygienic eateries available in Siliguri town. Now you are all set to head for Darjeeling. Visit Roads To Darjeeling to know about all the road routes, directions, attractions and villages on the way to Darjeeling. If you plan to take a taxi from the NJP station, there will be hundreds of them just outside the station. The taxis are usually small cars or vans. You get larger vehicles like Sumo, Tavera etc as well. Remember that the local drivers always try their opportunistic chances and there is always a scope for bargaining if you are taking a full taxi. The rates usually increase during the high tourist season and the scope of bargaining reduces during such time because of higher demand. However for a reserved taxi, I would always recommend that you take a pre-paid taxi. There is a pre-paid taxi booth (a small kiosk) located opposite to the station entrance and near the taxi stand. Here the rates are fixed and the taxis will be far more reliable. You will be given a slip against a full fare advance payment. Once you reach Darjeeling, you only need to hand over the slip to the driver, and that's it. The pre-paid counter at NJP station usually opens at 7am in the morning and closes by 7pm. If you reach NJP late at night, you may still find a few taxi drivers outside offering a drop to Darjeeling or other places. And they will of course charge lot more. While taxis do ply on the main roads to Darjeeling late at nights, but watch out for the fog. It can get extremely risky if fog hinders visibility which is often the case at night. So unless absolutely necessary, avoid driving at night and plan in advance to stay back for the night at Siliguri (a twin city only 5kms from NJP). I would anyway avoid driving for over 3 hours in darkness and on winding mountainous roads with an unknown driver. Visit Transport Fares to know about the reserved taxi fares. Note that the taxis usually drop you only at the Darjeeling town center, i.e. either at the Clubside Taxi Stand (across Gandhi Road Police Point) or Chowk Bazaar Taxi Stand at the lower level. From here you will either need to take a local cab or a porter to the hotel unless you decide to walk. However, on request some taxi drivers do agree to drop you at the hotel and sometimes at a nominal extra charge which you pay directly by cash. Note that in Darjeeling, there are some pedestrian only zones where vehicles are not allowed like the area around Chowrasta Mall. If your hotel is located in such area, you need to from the nearest taxi stand (you will get porters to carry your luggage though). Usually there are plenty of shared taxis available outside the NJP station. The shared taxis are usually jeeps and take two persons in front next to the driver, four in the back seat and four others at the rear seat. So they won't start unless they have a minimum of 8-10 passengers. While the shared jeep is convenient, fast and cheap, one constraint is you can not carry too much of heavy luggage. All the bags and suitcases are carried free of charge on the roof without any additional charge. If you want a little more comfort, you can book both the seats in front or a row of seats at the back by paying for those extra seats. Then the driver won't let other passengers occupy the seats you reserved even if they go empty. Sometimes, you may get shared taxis in form of smaller vehicles like Maruti Vans as well. If you like to avail a luxury class shared taxi (like Innova) to Darjeeling, you can get one from Siliguri but you need to book seat online in advance. Go through Shared Taxi Service for complete information about both conventional cheap shared taxis as well as luxury class shared taxis. If you for some reason don't get a shared jeep or a taxi from NJP station, another option is to take an auto or a cycle rickshaw to the Siliguri main bus stand known as the Tenzing Norgay Central Bus Terminus. It is about 8kms away. From here you will get plenty of shared jeeps leaving for Darjeeling. The jeeps have a small board in front of them with the destination written on it. The system of seat sharing is followed here as well. Visit Transport Fares to know about the shared jeep fares. As per the NBSTC bus time table, there are presently two bus services from NJP to Darjeeling via Siliguri (one at 8:30am and the other at 10:30am ... timings are subject to change). Another option is to go down Siliguri and take a bus. There are several bus services from there. You will need to come to the Tenzing Norgay Central Bus Terminus at Siliguri located on the Hill Cart Road. It's only about 8kms from NJP. You can take a taxi, auto rickshaw or a cycle rickshaw to reach there. From here you will get plenty of state run and private buses for Darjeeling that leave frequently. Check out Siliguri to Darjeeling for more details and options of reaching Darjeeling once you come to Siliguri. There is a toy train which is run by Darjeeling Himalayan Railway. It starts from the NJP station and goes all the way to Darjeeling. The narrow gauge track climbs uphill and passes via the highest altitude railway station in Asia known as Ghoom. The toy train which is part of UNESCO World Heritage Site, was introduced during the British colonial days in 1800s and is still operational. Until recently, the train was hauled by steam engine and took over 10 hours to reach Darjeeling. Nowadays, it is hauled by a diesel engine and takes about 7 hours. Visit Toy Train Rides & Services and check out the section under Regular DHR Toy Train services to know about the toy train, its timing and how to book the tickets. The toy train goes through a scenic route offering breathtaking views of the mountains and valleys. You will also experience the village life. The narrow gauge track has several zigzags and loops on the way to negotiate steep gradients. Visit Toy Train Route to know about the journey and all the stations it passes through. If you arrive at New Jalpaiguri late at night or depart very early in the morning, then you can consider staying overnight at the railway retiring room at NJP station. This is unless of course you have a hotel booking at Siliguri for overnight stay and a car to take you there. It's not recommended to travel in the mountains late at night. The good news is NJP station has several 2 bedded, 3 bedded a/c and non a/c retiring rooms as well as dormitory beds for this purpose. Such accommodations can be availed only by passengers holding valid and confirmed railway tickets and they are quite cheap. Recently the railway site www.irctc.co.in has launched online booking of its retiring rooms all across India including NJP. All you need to do is visit their site and click on 'Retiring Room'. It will ask you for railway ticket PNR number, source or destination where you want to make the booking, date etc and then show you the current availability. You can pay online and make the retiring room booking easily. Booking is allowed for minimum 12 hours to maximum 48 hours. 1) Visit Bus/Taxi/Toy Train Fares For Darjeeling to know about fares for buses, private & shared taxis, shared jeeps and toy train etc from NJP/ Siliguri/ Bagdogra and up to Darjeeling. Is there a good place to stay in New Jalpaiguri, I will be getting down at NJP in the middle of night and not sure how this place is. Will it be a good idea to book a cab and drive to Darjeeling at night from New Jalpaiguri. There are several stray hotels in NJP. Better stay in a hotel at Siliguri (10 minutes by cab from NJP). There are plenty of good hotels there. Better avoid driving to the hills at night. Hi. Thank you very much for your nice and helpful comments. I was wondering if there is some kind of locker room or something to leave some of our luggage in the station during a few days (5-7 days) while we will be in Darjeeling and Sikkim, in order to carry out less weight during our trekking. Thanks a lot. Kind regards. Hi, cloak room facility is available at NJP station where you can keep your luggage. You need to pay a nominal fee per day for each baggage. All bags bust be locked. You need to have a valid railway ticket reaching or leaving NJP to avail this facility. Contact the station master at NJP station once you reach. If you reach late at night or early in the morning, you need to wait until the station master's office opens. I will visit Darjeeling on 29th - 31th March. I'm planning to reach NJP by train, and then take a shared jeep to head to Darjeeling. But the train reach NJP quite late around 6pm - 7pm, so I am wondering if there is any shared jeep or car still works at that time? Thanks a lot. You will get private taxis, but not shared Jeeps. Hello, We are a group of 11 people, reaching Darjeeling on 23rd April, 2017. Can you please confirm if there is an option all 11 of us could be accommodated in a single car from NJP to Darjeeling. You can consider a Tempo Traveler or a minibus which can be organized through a travel operator in Siliguri. Hi Raj Sir, Once again I have a question for you. What are the direct options of coming from njp station to Kurseong? Is there any prepaid booth like bagdogra airport? Please inform. Thank you very much and regards. There is a pre-paid taxi booth just outside the station platforms. You can also avail a shared jeep. Or go down to Siliguri main bus stand for a bus ... there are four buses daily. Hi Raj! First of all, I would like to thank you for providing such detailed information about Darjeeling - Queen of Hill Stations. I am planning for Darjeeling in the month of November with my wife. I would be reaching New Jalpaiguri at 22:00 hrs. I wanted to know is there any way to move for Darjeeling late night and if not; where to stay overnight at New Jalpaiguri for one night before leaving for Darjeeling? There will be several stray drivers offering you drops at night, but those will be risky and I won't recommend that. You can either stay overnight at the retiring room at NJP station or else stay in a hotel in Siliguri which is within 10 minutes driving distance. There are plenty of hotels of all types there. But ask the hotel to send a car for pick up from NJP station instead of taking a stray taxi. Hi sir please help me. I will reach New Jalpaiguri at 10/05/2016 by Shatabdi Express train at 10.30 night. And I go from New Jalpaiguri to Gangtok by road (cab or bus anything). So please tell me can I get any local bus or cab at night after 11 from New Jalpaiguri to Gangtok, thanks. You can get some stray vehicles (taxis) at such late night who can charge high fares. I do not recommend late night drive in the mountains. Often car drivers remain drunk. Better stay back at a hotel in Siliguri, ask the hotel to send a car for a pick up, and move next morning. Raj, hi!!! Just wanted to ask you whether there is an elevator at the NJP station to facilitate elderly senior citizens to climb up and down to cross the railway overbridge. There is an escalator at the outer end, a stairway plus ramp at the platform end, and a long over-bridge to walk in-between. So it's wheelchair accessible, but otherwise requires a long walk. The escalator goes both ways - up and down, but only to bring you up to or down from the over-bridge. It's a short escalator at the entry/exit, but helps negotiate the gradient at this end. Is it safe to stay in retiring room with family at night at NJP station & is it clean enough. after booking to whom I will contact for room key. It's safe and fairly clean. You should meet the station master on arrival. Hi, I am having a confusion sir, I am reaching NJP at 8pm and i have a toy train ride booked for the next day at 8am. What would you suggest so that I don't miss my toy train ride and at the same time reach Darjeeling. Thanks in advance. You need to travel to Darjeeling at night. Better ask your hotel to send the car for a pickup rather than taking a stray taxi at night from the station. It might be costlier, but that is more sensible thing to do. I am coming to NJP with my family on 15 february 2015. My train (Guwahati Express) will reach NJP at 21.55 Hrs. Will it be possible for me to get a taxi right away and go to Darjeeling same night ? Or will I have to pass night in NJP and get the taxi next morning? If it's the case, are there hotels nearby NJP railway station to pass a night with a family ? Please guide me. Thanking you very much. Pre-paid and regular taxis do not operate after 7pm. But you will get some taxis outside and the drivers may charge more than normal fare. Also driving late at night in the mountains is not recommended... drivers may be drunk, fog can create problems etc. Better to stay back at NJP station retiring room for the night or book a hotel at Siliguri (10 minutes from NJP). You can now book retiring rooms at NJP online through www.irctctourism.com. Proceed next morning. Pre-paid taxi booth opens around 7am. I am traveling with my family including one infant. I was reaching NJP at 3am from Mumbai, so can I get transport to darjeeling at that time or else where to wait & at what time I will get transport. Please guide me. Thank you Raj. Wait at the retiring room at NJP station. There might be one or two drivers outside offering you a drop at that hour. Try to avoid. 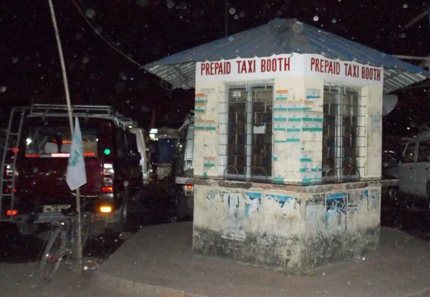 The pre-paid taxi booth just outside the station opens around 7am. Hi, NJP to Kurseong takes about 1hr 45 minutes by taxi. Take a pre-paid taxi or a shared Jeep from NJP station. They should take the road via Rohini, which has been newly repaired... it's in good condition now. I would like to know about the frequency of the shared jeeps from NJP station to Pelling and Darjeeling to Pelling. Where is this taxi stand situated in Darjeeling.Are these direct jeeps to Pelling? When does the last jeep start from Darjeeling. Also what is the journey time to Pelling from Darjeeling and Njp. NJP to Pelling takes about 6 hours via Jorthang (located about midway). You will get shared Jeeps from Siliguri near SNT (Sikkim Nationalised Transport) bus stand. They Leave at 7am and 1pm, and usually go up to Yuksom via Pelling. Note that the timings may change, but usually there are two shared Jeep services from Siliguri on a day, one in the morning and the other in the afternoon. Darjeeling to Pelling takes about 5 hours. You will get shared Jeeps from Clubside and Chowk bazaar taxi stands in Darjeeling. Note that they take more than 10 persons in a jeep and you will need to remain crushed in a pack of local commuters for hours. Good luck! You are unlikely to find transport late at night at NJP. The prepaid counter opens around 7am. But you may start getting private taxis outside the station before 7am (several taxis come to drop passengers who catch morning trains). But I suggest not to travel even if you manage to get a taxi late at night mainly because of the fog problems. From all places you mentioned, you will start getting shared and reserved taxis from around 7am. Hi Raj, At first I thank you a lot for this kind of informative and helpful website. No other website is as helpful as this one. Hats of to you Raj. Please note my little query which you please answer. I will go to Darjeeling on 30th Dec 2013. This is the 4th time for me. It is one of my most favorite places. We are now 14 persons including 2 children and 4 senior citizens. I want an advance booking of a suitable car. Can you please provide me contact details of a reliable travel agency/driver/person for traveling NJP to Darjelling and which car you suggested for us. Please reply. Hi, For 14 persons, You will need two large vehicles (like Scorpio, Sumo etc) or a minibus. Best is to ask your hotel to organize the transfer and give you a good rate. Otherwise you can go through one of the several travel agencies in Siliguri (try google search). One of them is Kings Travel, they are good but usually their rates are also higher. Try to take a quick quote from 2 or 3 operators and decide on one. Note that for kids & seniors, the route via Mirik would be better. It's longer (takes one hour more) but not that steep or winding. Rates will be higher for this route though. Talk to them over phone. Hi, The pre-paid taxis are usually available from NJP station from around 7am onwards. So you will need to wait at the station if you reach on time. You can get Sumo or Bolero on pre-paid as well. I won't recommend travelling for Darjeeling while it's dark. It's mainly because of the fog problems. Driving through the fog along winding road is quite risky. So start only after the daylight breaks. If you want to pre-arrange a vehicle, you will need to contact a tour operator or travel agency in Siliguri. There are plenty of them... search in google. Hi, There are waiting rooms as well as retiring rooms (both AC and Non-AC, although limited) and also dormitories at the NJP station. There are 2-bedded AC & Non-AC rooms, 3-bedded non-AC room, and ample dormitory beds. At that hour you will be better off staying back at the station rather than trying to check into a hotel. Taxis & shared jeeps start operating by 7am. You may get private taxis even earlier. Dear Mr. Raj, Really appreciate your thoughtful, practical and informative guidance provided in these web pages. We are a family of 3 adults (myself, spouse and mother) and 2 kids (ages 4yrs & 7yrs) intending to take a 5 days Gangtok-Darjeeling trip this May. I request you to provide me information on eating options, particularly breakfast and dinner at or near NJP railway station. I will be arriving NJP around 9am by Padatik express and leaving NJP after 5 days thence by Darjeeling Mail around 8pm. Hello, There are lots of stalls that have come up just outside the NJP station and by the side of the road selling all kinds of food. They all thrive on train passengers and serve breakfast, lunch and dinner. But I doubt the hygiene factor. See the photo above.